The Buddha and Christ both spoke of the virtue of turning the other cheek when wronged, but no one has suggested, to date, that if violently sodomized it would be the correct thing (excuse me) to turn the other cheek, and furthermore, shower the sodomizer with affection and praise. So why the outpouring of grief from the CTA and other exiles for the death of Baba Phuntsok Wangyal? 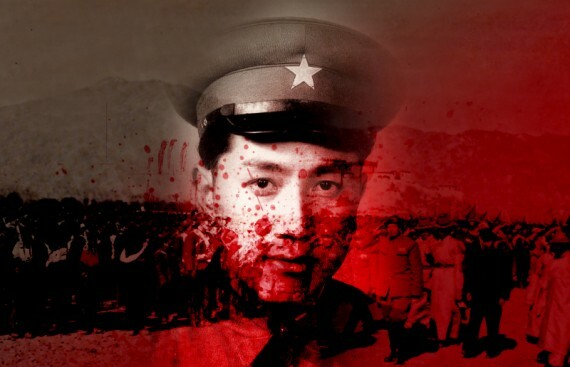 No matter how “charming” a person, a “good Communist”, or a friend of the Dalai Lama, Tibetans must remember that Wangyal was the principal front-line guide to the Chinese army when it invaded Tibet. He was not just a “guide” in the neutral or passive sense of the word but someone deeply involved in the planning and organization of the invasion force, as his own autobiography testifies. In fact he had the crucial task of organizing the transportation by mule and yak of PLA supplies through Kham, without which there would have been no invasion. The motor road had not yet been built. I don’t want to write anything more about this self-important, self-deluded, and simpleminded wretch whose actions contributed in full measure to the destruction of our civilization and the death of well over a million of our people. It is just too depressing. Anyway veteran Indian journalist and friend of Tibet, Vijay Kranti, has come out with an outstanding “alternate tribute” in Phayul.com to counter the “slave mind-set” of Dharamshala on this issue. It is must reading. I will just offer an excerpt from a (four part) essay on the modernization of Tibetan language that I wrote eight years ago, which I think might provide a psycho-political analysis (of sorts) for Phuntsok Wangyal’s treason, and the risible pseudo-intellectual and pseudo-revolutionary apologia offered by his present day admirers. “An examination of Phuntsok Wangyal’s life and mindset is rewarding in understanding how in the name of “progress” and “reform” someone could bring himself to so casually inflict such tremendous damage, not just on a language but on an entire culture and society as well. Wangyal is the kind of model cadre, who having studied and embraced Communist ideology feels absolutely confident to pronounce (and act) on matters he has little knowledge about. “A bizarre but revealing example of this characteristic is provided by Phuntsok Wangyal’s magnum opus, New Investigations into Celestial Bodies — Liquid Water Does Exist on the Moon. (Foreign Language Press Beijing, 2002, available in the USA, free of charge, at the International Campaign for Tibet). Wangyal wrote it after his release from prison, and it is fairly substantial at about 500 pages of closely-spaced small print. He claims it is a scientific treatise on cosmology, and though there are references to Copernicus, NASA, and some contemporary Western scientists, the intellectual “big guns” brought into play to “prove” that the moon holds deposits of liquid water are Hegel, Marx and Engels — or more properly their “dialectical methods”. The emphasis on “liquid” in the title is interestingly emblematic. It might be easier to prove that there are deposits of frozen water on the moon, but such reservations or compromises are unnecessary. Dialectics of this kind has the power to prove anything you want it to. “In conversations and interviews Phuntsok Wangyal consistently maintains that Marxist dialectics is the “mother of all sciences” and “the ultimate science of all sciences”. No matter how bizarre such thinking may seem to us now, it is in the grand tradition of Marxist scientific absolutism employed by Trofim Denisovich Lysenko, a semi-literate peasant from Azerbaijan and Stalin’s master agricultural expert. Lysenko was the author of “The Great Stalin Plain for the Transformation of Nature”, which in effect produced Russia’s “Great Famine”. In China, Mao’s “Red specialists” and “barefoot scientists” led by China’s own chief Lysenkoist, Luo Tianyu, ordered peasants to plough deep (sometimes down to ten feet), and to plants seed closely like “the scales of a dragon”, besides many other lunacies, causing history’s greatest famine and the death of 30 to 60 million people. I must admit that I was only able to come to some sort of understanding of Wangyal’s extraordinary dedication to Mao and Maoism, by recalling an earlier reading of a comparable account in political fiction. Arthur Koestler’s masterpiece, Darkness at Noon, is based almost directly on Stalin’s show trials of the 1930s, and describes the imprisonment, trial and execution of the old Bolshevik, V.S. Rubashov. The striking thing about the two reminiscences, despite the fact that one is fictional the other real life, is how Rubashov and Wangyal’s loyalty to the party and leadership remain unshaken in spite of the fact that both are old party-men who have been cruelly betrayed by their leader, party and faith. In Rubashov’s case he even ultimately confesses to crimes which he is well aware he has not committed. Wangyal does not confess but performs a more convenient sort of self-deception by blaming his incarceration on petty functionaries and not the Great Helmsman himself, whom “he idolized”, as the Dalai Lama mentions, approvingly, in Freedom in Exile. George Orwell, reviewing Koestler’s novel, writes that he was convinced that Rubashov and those like him “had been rotted by the revolution which they served” and had become morally and mentally bankrupt by the “habit of loyalty to the party”. “Koestler also implies in his novel that Rubashov in power would be no better than those persecuting him now — and I think one could safely extend the observation to Wangyal. Milan Kundera, writing of his childhood, observed “When I was a boy I used to idealize the people who returned from political imprisonment. Then I discovered that most of the victims were former oppressors. The dialectics of the executioners and his victim are very complicated.” Wangyal’s fanatical self-righteousness remains intact after eighteen years of torture and solitary confinement. It is untouched by any regret, or clouded by the least of doubts that by guiding a hostile foreign invasion force into his own country he bears considerable responsibility for the genocidal devastation of Tibet and its culture, and the ongoing oppression and exploitation of his people. “Getting back to the issue of language “reforms”, it might be noted that from the conservative Lhasa-centric point of view, Phuntsok Wangyal, Jampel Gyatso, Sherap Gyatso, and others were essentially provincial intellectuals, with big chips (social, economic, linguistic) on their shoulders against the ruling Lhasa elite. And in spite of the lofty claims of “reform and progress” by these Tibetan Communists, there clearly was a substantial element of payback in their agendas. The only incongruity being that since Batang and especially Amdo had for long been under Chinese administration, whatever injustice or suffering our revolutionaries and their kith and kin might have experienced earlier in their lives were almost certainly inflicted on them by Chinese regimes and definitely not by the Lhasa government.